A funny thing happened on “pure, innocent victim of racism” Michael Brown’s way to visit granny: he robbed a store. Will HAMAS CAIR and anti-Israel Muslims apologize for their non-stop campaign this week to paint the Ferguson shooting as “raaaacism!” and Israel’s fault? Nope. Now, that we know better, they have egg on their face. And, yet, they continue to serve up this phony scrambled egg story. So, now, after nearly a week of riots led by race pimps, we know that the shooting of Michael Brown in Ferguson, Missousi is not the “evil racist White police” story we’ve been hit over the head repeatedly with. 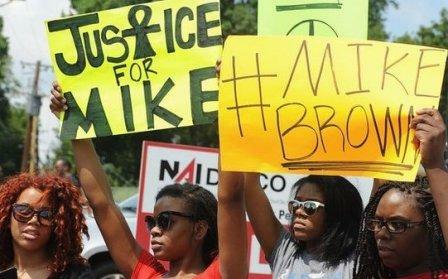 We know that Michael Brown engaged in robbery, and we know that he was confronted with it by the officer who shot him. We also know that Michael Brown ain’t the nice, innocent, good guy we were told repeatedly he was, as if it were the gospel. Yet, before waiting for any details to come out and before knowing anything about this, the unindicted HAMAS co-conspirator, CAIR (the Council on American-Islamic Relations) spent all week urging imams to use racism and the Ferguson shooting as themes in their sermons–you know, so Blacks will think Muslims are “down wit da struggle,” instead of members of the religion that sold them into slavery and continues to enslave them all over the world, today; and the religion whose members refer to them as “abed” and “abeed”–singular and plural for “slave,” but actually the Arabic/Islamic N-word. Also, in the Ferguson race riot protests, there were Muslim flags that sprouted among the protesters. Last night, HAMAS CAIR Michigan official and convicted criminal Dawud Walid a/k/a Delano Anthony Willis, Jr.–who said “Zionists control the media” and said Muslims were commanded to kill us–was a featured guest on Detroit’s FOX News affiliate, where he whined about the raaaaaaacism! in Ferguson and all over America (which is funny because the “raaaaaaacists” have allowed this anti-Semitic, anti-American, terrorism-fan bigot and criminal to do quite better than White people with no such poisonous views and history). And, this week, Muslims tried to blame Israel as the cause of the “evil White POOOOOOOOOO-LEECE” shooting of Brown. 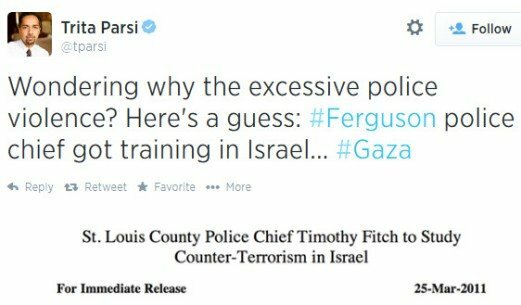 See above tweet above from Iranian Muslim and Jew-hating author Trita Parsi, who claims he “leads largest Iranian-American grassroots org.” (Reader Mikhail: “Did you know The JOOOOOOOSE did it?”) Well, now, that we know more, maybe Israel should get the credit for showing police how to deal with criminal thugs. Well, now we know better, so is Michael Brown’s family apologizing for their son’s noxious, criminal behavior? Um, HAAAAAAYYYYLLL NO! Nope, they are whining that the truth (troof?) got out. So, typical. Typical in Trayvon Martin’s case, in Tawanna Brawley’s case, in every case like this. And, gee, who’s involved in all of these race pimp conflagrations? 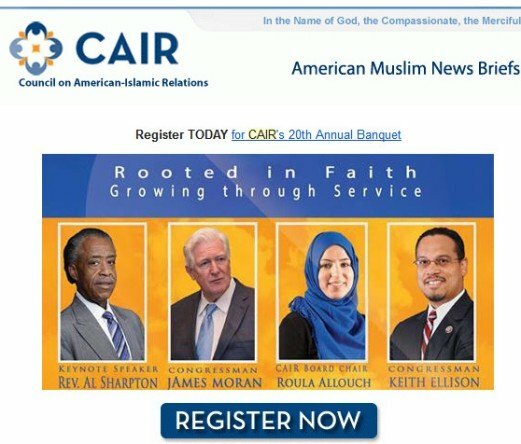 Al Sharpton, who is, by the way, the keynote speaker, at HAMAS CAIR’s upcoming annual banquet. Alhamdulilah [praise allah]! Don’t wait for apologies. Race pimps–and their willing minions throughout Black America–never apologize. Instead, they press on about racist police, racist media, racist honkies/crackaz, racist everyone but the real racists: them. This poor police officer won’t get to clear his name, even despite the facts that have now come out. He will forever be the raaaaaaaacist! cop. The mold has been cast. And racists don’t recast molds when truth comes a-knockin’. They break the mold and insist it was the way they claim. Anything else gets in the way of their agenda. Cha-ching! One last question (which I always ask during the Muslim protests that occur in Dearborn): how do these hundreds or thousands of people have the time to take off of work to spend all day protesting? Answer: they don’t work. Why should they? You are paying their well-deserved reparations: Obamaphones, ObamaCare, welfare, AFDC, etc. So, yes, you paid for their absurd protests against police and in favor of a violent criminal thug, Mike Brown. I wonder what would happen in the Ferguson police just closed up shop (and there were no state troopers taking over). Well, we know what would happen, and the Ferguson race riot crowd would be begging for police. 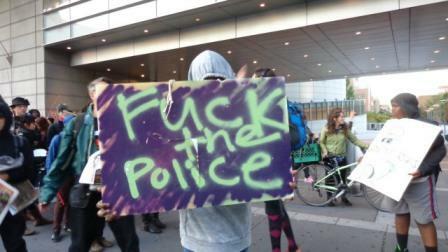 I get a warm, fuzzy feeling knowing that thugs like Brown, et al. will have 0bamacare health insurance. How similar it was to the London riots in the UK. How similar the media coverage was to that of the conflict in Gaza. This is a manufactured crisis by a very unoriginal bunch of community organisers. Americans used to be self confident about being American like Mark Twain. Now they need someone foreign to tell them what he’s supposed to mean to the world. Just sad. Debbie – You need to stop confusing people with the facts and let them get on with their lying narrative. Theirs has better sound bites. It has just been revealed that the police officer had physical marks on his face from where the overgrown theif and bully hit him in the face. Good riddance to another thug! No, he just saw he was blocking traffic and acting suspiciously. Not a cause for concern, though, is it. After all, the leftist riff-raff block traffic and act unruly all the time. The Chief should have been used to it, right? I’m not surprised that Muslims are trying to gain converts from the residents of Ferguson. Isn’t that who they try to recruit? Felons in jail? Isn’t that where Malcolm X was recruited? Criminals make the best converts to Islam. They fit right in. There was a reporter / anchor on a local cable news channel in Long Island, New York, who was actually fired after he opined on the air about the epidemic of fatherless black families and the high incidences of crime in those communities related thereto. But it warms the cockles of my heart to see the strong stand the Republicans are taking in defense of the police. We should praise President Obama’s fine contribution to restoring calm to the residents of the town. President Obama condemned the many black people who engaged in acts of violence, and he said that he was ashamed that Black people were looting stores as if there this were some cause for celebration. He said that such looting was not his idea of wealth redistribution and that such redistribution must be a US Government function. So at least there’s a bright side to this story. Oh, like HAMAS enabler Rand Paul who claimed that Ferguson was an example of “overmilitarized” police out there? And these witnesses? Think of jury nullification, e.g. the O.J. case — that should tell us something about the quality of these witnesses. And, of course, as Debbie mentioned in this post, these people NEVER apologize for being wrong; they simply move onto the next outrage. I can give you a whole laundry list of examples showing how morally bankrupt they are. Hey Debbie, I got more good info for you, including stuff about a certain Haim Saban; want me to share it with you? And look at how the White Southerners like myself was treated during the black revolution of the 60’s .You see ,the truth has never been told what the blacks did to the Whites in the South because as usual the news media only shows one side .Those poor innocent blacks being so mistreated by us mean ole Southerners .The news media didn’t show how the blacks threw rocks at people’s cars as they passed by ,they did not show the blacks ganging up on the white kids in school and trying to trip us and shove us in the hall way .They didn’t show how they robbed Jewish stores in the South and I can go on and on with this .The blacks are no different than the Muslims Israel is dealing with they are all full of hate for Jews and Whites . This bum is on tape stealing cigars. Then pushing and choking a store clerk. When the clerk tried to block him the criminal pushed him away. Eventually coming back into store forcing clerk to retreat. At the risk of appearing racist, it appears that when you import criminals and let them breed amongst themselves, chances are that you’ll get more criminals due to genetics. So if you get a family rife with thieves and thugs and one of their own get pwned by the popo, would they apologise for their kin’s reckless behaviour? As for that columnist’s rant that Ferguson, MO is another Gaza, was he implying that Jews killed Michael Brown? Was Brown an activist or community leader? Did he discover a cure for diabetes? Inquiring minds would like to know. If a white cracker confronted a black cop like a violent thug, it would be a justified shooting. In this case, the violent thug happened to be black shot by a white cop and all hell breaks loose. Then again, in the universe of the race merchants, people of a given skin color are never accountable for their actions. The very same people who demand equal treatment in reality demand some people be given special treatment due to their skin color. No wonder the irony of their racism is lost upon them. And no they will never apologize for their insolence, self-righteousness and blatant hypocrisy. “American journalism is people who can’t recognize the truth, interviewing people who never tell the truth, for people who don’t want to hear the truth. 1) First blame whites no matter what. 2) Then go check the facts.If you find no evidence for what you wrote, change subjects and keep blaming whites. 3) If God forbids, whites are not to blame, go to rule number 1. I’d click “Like” for that comment. But there is no button for that. @ Reverend Jaques- Please do not post on this blog again. Can we say the word FOOL. The pictures of this kid are pretty damning and intimidating grabbing that much smaller, frail man, man handling him like a raggedy Ann doll. Now that we have most of the facts, we can piece together what most likely happened. The officer doing routine patrol seen these two kids walking in the street possibly impeding future traffic (not acting suspiciously, like the writer of this blog assumes), not knowing that they are suspects in a strong arm robbery, however the kids didn’t know that, believed they were caught, put up resistance hence the shooting. After seeing the video tape of these ruffians, the other kid being that he was Michael’s accomplice, has no credibility. One other thing to note. People need to stop bringing up Tawanna Brawley, that happened 30 years ago, even though Al at times doesn’t help matters and exacerbates them, Tawanna is who lied, not Al, Tawanna lied, and it was 30 years ago, give it a rest. The issue of “proportionality” was raised because less Jews than Arabs were killed in Gaza. Then how come everyday hundreds, if not thousands of innocents are killed by Islamists and all you hear, see or read about is one black killed in Missouri? The truth is here for all to see. Some do not desire to gaze upon it. This is what you get when you artificially support a demographic that is incapable of contributing to a healthy society. You certainly do not engender feelings of gratitude. But America will never deal with it voluntarily. Too much immaturity. Eventually, nature will force the childish American to face the truth. If the facts in this article were not enough, we’re now seeing tweets from Subhuman Vermin Iranian “Supreme Leader” Ali Khamenei about the violent police misconduct in Ferguson and the “oppression” of the Black people, much the same as Israel is “oppressing” the Muslims. One would think that such views–that are the equivalent of camel dung worm excrement (with some apologies to the worms)–would only sharply differentiate the clear demarcation between good and bad here. Clearly, the black racists and the media have created a circus around a thug who happened to get shot, which then became an excuse for rioting, looting, arson, and violence. According to the Islmoterrorists weighing in on the Ferguson situation, there should be no police or military intervention to protect the law abiding residents and businesses. According to the Islamoterrorists, they deserve the rioting, looting, arson and violence for their “oppression” of the thug’s rights–much as Israel deserves the same. PS: Ignore the leftist commentary inherent in the Yahoo link I provided. Yahoo is still Yahoo, so they always try to stick their leftist viewpoint into every article to publish. My point is to see the tweets from the Subhuman Vermin Khamenei, not the vermin at Yahoo. Thanks. EVERY article, Mr. Adamo, EVERY article. Yahoo! News might as well just be pointing at George Soro behind the curtain The Muslim-In-Chief stands in front of, and say it. They also seem to double as press agents for Liebowitz and Cold Bear. All black thugs are innocent….don’t you people know any better? I understand that there was, uh, confusion in Ferguson last night because of the curfew. Not lawbreaking, but, er um, …confusion. Before I start my take on the Ferguson shooting another of Obama’s sons let me state who I am for the record for those who don’t know. I’m a Black Christian Conservative Republican in that order. There now that’s cleared up let me just say a few things. Once again we have a shooting of a young Black thug, er, gentleman by a “racist” White cop. As per usual the people used the issue to vandalize, rob, loot their own neighborhood and act like fools on TV. Also as usual the race baiting dofusses “Da Justus Brothas” Jessie(Babymama)Jackson and Al(Tawana Brawley)Sharpton(is it just me or does his head not fit his body) show up to stir up the masses. I just love it when liberals say that those two clowns speak for the Black community. Well they don’t speak for me and from what I’ve heard people in Ferguson are getting tired of these two nitwits especially Crazy Al. Not only that but our esteemed joke of a CinC once again stuck his nose in a racial matter. I’m surprised that he just didn’t say that the Ferguson police acted stupidly. ISIS/ISIL gives us the middle finger, while Putins laughs and this is what Obama focuses on. Let’s not forget the most corrupt AG in history Eric O’Jockholder. His investigation along with a 5th or is it 3rd autopsy of Brown’s body should be an unbiased affair right folks. Uh huh. Now we have CAIR and idiot Muslims blaming the Jews for the shooting. This was done to further inflame stupid liberal Blacks who think that Muslims care about them. Note like Debbie says they don’t because they think your nothing but the “N” word but why let a good racial crisis go to waste. And now for the truly funny part in this is ole Mikey went to go shoplifting for a pack of smokes just prior to him getting shot. He’s on tape shoving the store owner. Now we know Martin was a big kid but from the looks of the tape Brown was really big kid. Now I have a question what was Brown’s state of mind before the shooting? Did he think that the cop knew what he had done prior to the shooting? Maybe that question will be answered. In either case look for this situation to get worse before it gets better. Especially with todays media doing the reporting. Melinda, you are absolutely correct. In the early 1990’s, I met an Iranian bookstore owner. He was a nice man, I thought, until we started talking about the turbulent 1960’s. This Iranian fellow thought that the 1960’s was a fabulous time for America. He was an enthusiastic supporter of all of the unrest, the lawlessness, the dissolution of tradition and the violence America experienced in those years. I knew nothing of Islam back then. Had I known then what I know now, our encounter would have been a lot more uncomfortable for that guy. I had read this comment of Trita Parsi on another website. What an idiot. I always figured the muslims in America are behind alot of the un-rest here. just sounds like their tactics. I thought the FBI and “no-fly” zones were strange too. I think the Ferguson market is still one to keep an eye on. stumbled onto this website. Some pretty good reads here. I firmly believe that there are two purposes for the constant race-pimping by Demoprogs like Sharpton, Jackson etc, with one being the obvious money etc that they get from it, but more importantly the political benefit that accrues to the Democrat party from pitting groups of Americans against each other. Remedial Alinskyite tactic: Agitate-Organize-Mobilize. With the November elections coming soon, they need agitation to turn out their base.